3 BR/ 3 BA Townhome Style Mountain Home! Beautifully remodeled 3 bedroom 3 bath end unit townhome (no one above or below you), with extra windows, located just 4 1/2 miles from Winter Park & Mary Jane Ski Resorts. Fully stocked kitchen, updated appliances, granite tile countertop and slate flooring creates the perfect ambiance for your meals. Vaulted ceiling in the living room, sofa sleeper, cozy wood burning fireplace and awesome views from your private deck. Custom travertine tiles in the entry way and in the bathrooms plus new bath vanities. All linens are provided. There are 3 TV'S plus a library of movies for your enjoyment. We are Wireless! Bring your laptop. There is a computer in the unit with high speed internet access available for your use during your stay. Enjoy the amenities of the Meadow Ridge Clubhouse located on the premises. Heated year round pool with towel service provided. No need to take towels from the unit. There are two hot tubs, weight room, racquetball/basketball courts, game room, steam room and spacious coin operated laundry room. Free shuttle service to & from the towns of Fraser and Winter Park Ski Resort. Plan a ski day, weekend or week and take the "Winter Park Express" by Amtrak from Denver's Union Station to the base of Winter Park Resort from January 7 - March 26, 2017. The Winter Park Express runs Saturdays and Sundays only (plus Martin Luther King Jr. Holiday January 16, 2017, and President's Day Holiday February 20, 2017). Book your travel on this historic train trip, which originated in 1912, at the early bird price of $39/one way. Only a limited number of seats are available for each train and each price level. Book early before the one-way $39 discount tickets are sold out. Tickets will then be available at $49 and then $59 respectively, as each lower-priced seat sells out. Discounted tickets are sold on a first come first served basis. With one-way tickets and service on Saturday and Sunday you can make it a day trip, a weekend-long trip or an extended vacation. Customize your length of stay at Winter Park Resort and get as much skiing/riding in as you'd like. Passengers with disabilities should call 1-800-USA-RAIL to book this trip. Questions about Winter Park Express should be directed to Winter Park Resort at 1-888-923-7275. Groups may book travel on Winter Park Express but no group discounts will be given. All groups must be booked through Amtrak Group Travel. Our Meadow Ridge townhome is a very roomy 3 bedroom 3 bath rustic getaway! We purchased it because we wanted something in the Winter Park area but with the amenities of Meadow Ridge! A full service gym with steam room, racquet ball/basketball court, 2 hot tubs, heated swimming pool, tennis courts etc. A spacious 3 bedroom 3 bath end unit townhome on the shuttle route just minutes to Winter Park & Mary Jane. There are 3 TV's plus a library of movies for your enjoyment! 3rd Bedroom is a loft with private bath! Convenient and comfortable. Thank you. Property was as described. It was comforting and very convenient to get around. Thank you. The condo was comfortable and close to Winter Park & Rocky Mountain Nation Park. We enjoyed our stay very much. One of the bedrooms is actually an open loft, so no privacy. Not enough paper products for our group of 6 for 4 days, had to purchase at the store. Clubhouse will not let anyone under 16 in without an adult present. Would recommend changing out the mattress in the 2nd bedroom, hard as a rock. 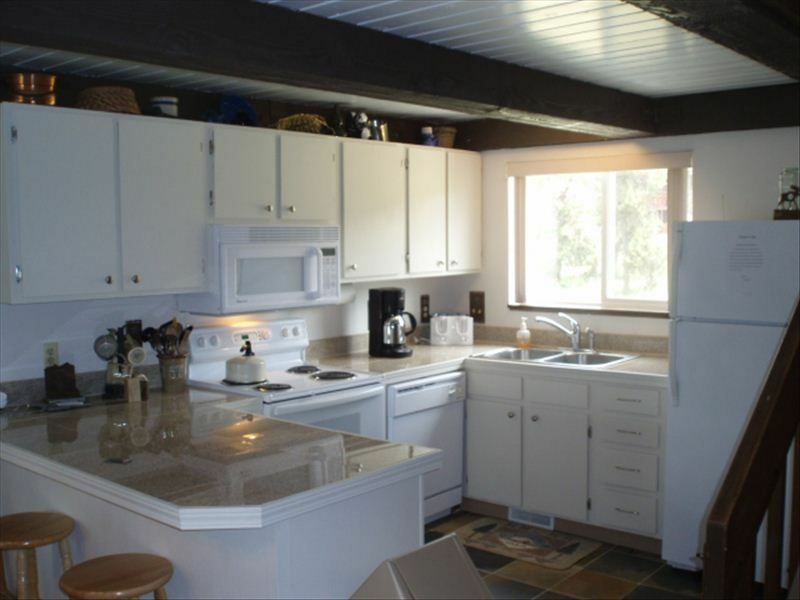 The property was in a great location, close to Winter Park and Lake Granby. We enjoyed our stay with our two kids at this property. It is a little older townhome but had everything we needed and will stay there again. Rich Trevino was very helpful during our stay. There was a small snag when we arrived, but the owner took care of that and we enjoyed the rest of our stay. We are located approx. 4 1/2 miles from Winter Park and Mary Jane Ski Resorts. There is a free shuttle route from our complex.